Only one supplement accompanies the film. 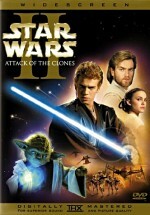 We get an audio commentary from director Dave Filoni, producer Catherine Winder, writer Henry Gilroy and editor Jason WA Tucker. At least some of them sit together for this running, screen-specific piece; Winder appeared to be solo. They cover visual design, cast and performances, score, story and editing, new characters and elements, animation issues, collaborating with George Lucas, and various challenges. 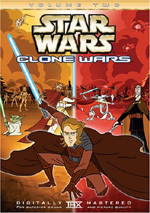 The disc opens with an ad for the Cartoon Network’s Clone Wars series. And that’s all she wrote! No trailer for the movie or any other extras appear here. However, a two-disc version of the flick can be found as well. 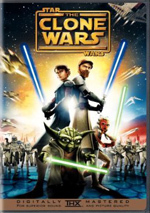 If you expect a mind-blowing epic piece of Star Wars adventure from The Clone Wars, you’re likely to end up disappointed. If you expect a lightweight piece of fun, you’re more apt to feel satisfaction. The movie doesn’t excel, but it entertains. The DVD gives us stunning visuals, very good audio, and a decent audio commentary. 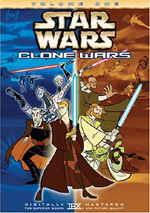 Though Clone Wars isn’t a classic, it gives us a good time.